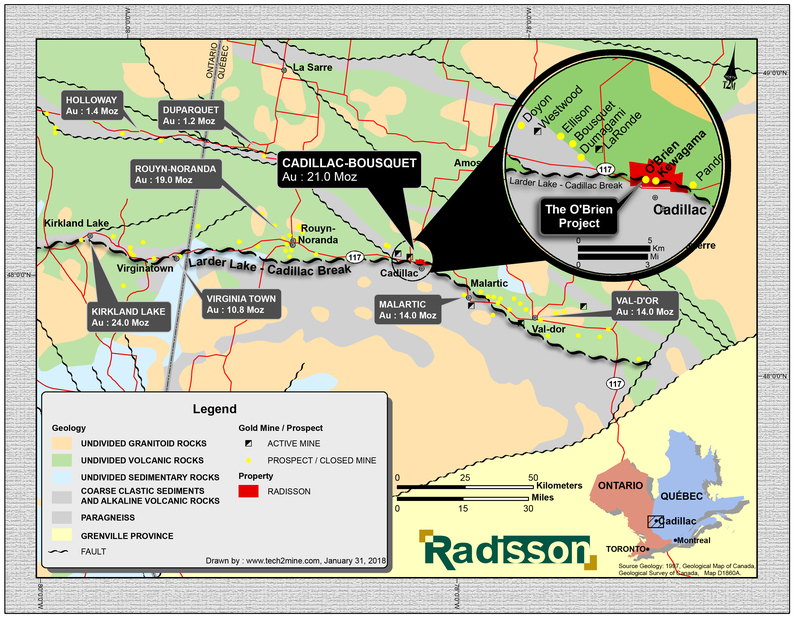 Rouyn-Noranda, Quebec: Radisson Mining Resources Inc. (“Radisson” or the “Company“) is pleased to announce that Kenneth Williamson 3DGeo-Solution has been retained to prepare a resource estimate update on the Company’s O’Brien Gold Project, along the Larder-Lake-Cadillac Break halfway between Rouyn-Noranda and Val-d’Or in Quebec, Canada. (See figure 1 and figure 2). Kenneth Williamson, M.Sc., P.Geo is a geologist consultant with over 15 years of expertise in the industry, specializing in structural geology interpretation, 3D litho-structural modeling and mineral resource estimation and he was responsible for the geological model review completed at O’Brien in recent months. 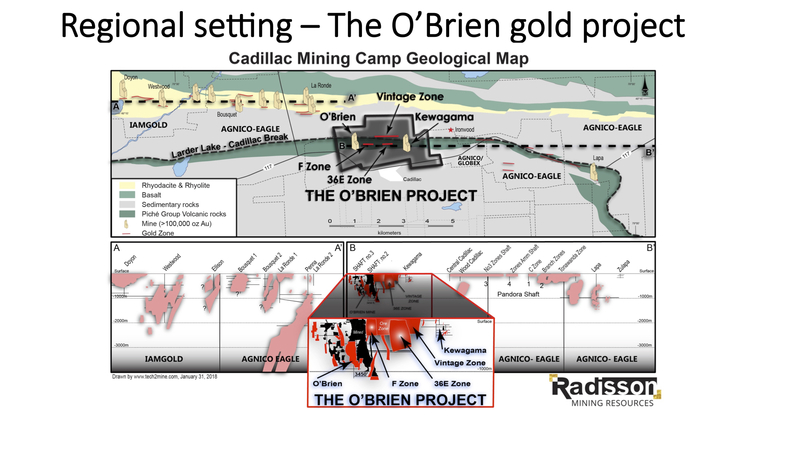 “The geological reinterpretation allowed to highlight the strong analogy between the current resource area and the Old O’Brien mine; where historic production returned a phenomenal head grade. The geological knowledge that Radisson gained through this work is significant enough in itself to justify a resource estimate update. In parallel, our team is planning the next phase of growth for the O’Brien deposit including exploration drilling on high-priority targets established along strike and below the current resource area” commented Radisson’s President and CEO, Mario Bouchard. The updated mineral resource estimate is expected in May 2019 and will be based on O’Brien’s recent geological reinterpretation completed in the last months, which highlights a strong compatibility with the historic data and geometry of the Old O’Brien mine. 16,201 metres of new drilling will be included in the updated mineral resource estimate. The F Zone area, located west of current resources will now be included in the updated mineral resource estimate. In the current resource area, the vertical extension of the known ore shoots was defined by drilling to a depth of 550 metres. In comparison, the Old O’Brien mine, which delivered 587,121 oz at a head grade of 15.25 g/t Au1 reached a depth of 1,100 metres and remains untested below. The new structural interpretation is based on current and historic drill holes and highlights a strong compatibility with the historic data and geometry of the Old O’Brien mine, where 90% of gold production came from the crossing of a conjugated veins system (Sauvé et Trudel, 1989). Three preferential mineralized orientations are observed; EAST-NORTH-EAST (“ENE”), EAST-SOUTH-EAST (“ESE”) and EAST-WEST (“EW”). Steep eastward plunging gold enrichment vectors (“ore shoots”) are identified on F, 36E, Kewagama and Vintage zones. These vectors occur at the intersection of the conjugated ENE and ESE quartz veins and locally, along the axes of asymmetrically folded quartz veins. In the current resource area, the vertical extension of the known ore shoots was defined by drilling to a depth of 550 metres. In comparison, the Old O’Brien mine production reached a depth of 1,100 metres and remains untested below. The Independent and Qualified Person for the Mineral Resources Estimate update, as defined by NI 43-101, is Kenneth Williamson, M.Sc., P.Geo, geologist consultant, and confirms he has reviewed this press release and that the scientific and technical information is consistent.